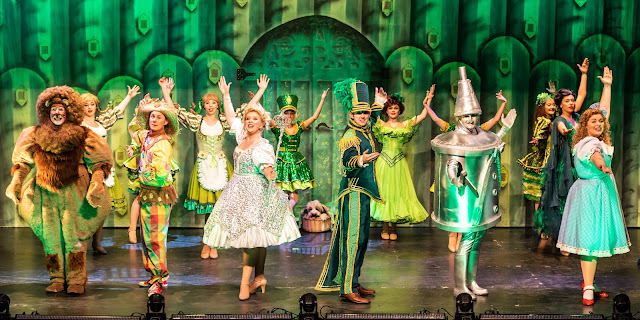 The good fairy Glinda opens the show setting the scene for the young audience members, with lots of singing, dancing, slapstick humour and audience participation we follow Dorothy as she is blown from her Kansas home to Munchkin Land. She sets off on her journey along the yellow brick road to try and find her way home meeting up with the Scarecrow, Tin Man and Lion along the way. Dani Harmer plays a great villain as the Wicked Witch of the West, getting the young audience members to boo and hiss her whenever she came on set. With lots of singing, dancing and adorable performances from the child dancing Muchkins it was a show that captured my young children (aged 3 and 5 years old) imaginations, they were transfixed throughout with plenty of laughter and shouts of 'he's behind you'. I really liked that they included Dorothy in the 'If I were not a ....' song as every other pantomime I have been too only the male cast members have taken part, this made a nice change. You could tell that the cast was having fun on stage, there were the odd prank and plenty of laughter and they recovered well from the odd slip-up. Like all good pantomimes the jokes came thick and fast and while some went over my children's head and were funny for us grown-ups there was still plenty of jokes the children understood. Cal Halbert brought plenty of laughter with his brilliant impressions and was a great addition to the cast while Recce Sibbald as the Scarecrow was comedy gold. Before we knew it Dorothy was tapping her sparkly red shoes together and it was time to head home. 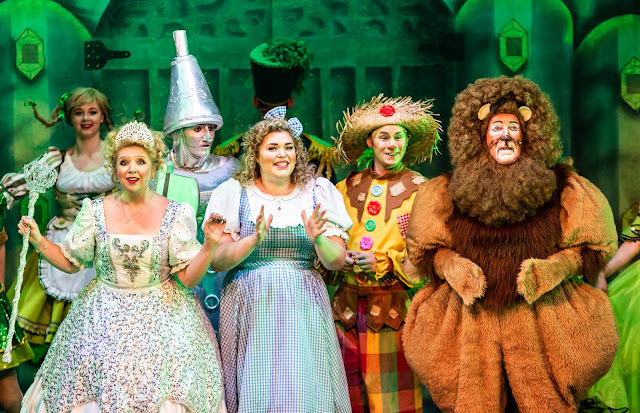 We really enjoyed this production and if you are looking for something to do with your children in the next few days then I really do recommend a visit to see The Wizard of Oz at the Whitley Bay Playhouse. The show is running until Saturday 4th August and tickets are available to buy from www.playhousewhitleybay.co.uk or from the Playhouse box office priced at £18.55 per person. Disclosure we received complimentary tickets for this show for the purpose of this review, however, all opinions are my own.